Halloween comes early this year, as the long-anticipated and long overdue sequel Rings finally hits theaters next month. Paramount has released the all-new trailer for this latest entry in the horrifying horror series. And it may disappoint, as it is only a minute in length. But that's enough time to scare the wits out of you. The ominous young narrator warns the following. "There Once was a girl. No one dares speak her names. In death she seeks vengeance for a life fueled with pain. Once you see her story, you have 7 days to live. Because she does not forget. And she does not forgive." Rings is a new chapter in the beloved Ring horror franchise. A young woman becomes worried about her boyfriend when he explores a dark subculture surrounding a mysterious videotape said to kill the watcher seven days after he has viewed it. She sacrifices herself to save her boyfriend and in doing so makes a horrifying discovery: There is a "movie within the movie" that no one has ever seen before! After being delayed too many times to count, Rings is finally coming to theaters February 3, 2017. The movie is directed by F. Javier Gutierrez. It stars Matilda Lutz, Alex Roe, Johnny Galecki, Aimee Teegarden, Bonnie Morgan and Vincent D'Onofrio. And the screenplay arrives from David Loucka and Jacob Estes and Akiva Goldsman. Paramount debuted the first Rings poster just this week. We've included it here in case you missed it, as it offers another look at horror icon Samara. Paramount released the first trailer back in August, making fans wait half a year for a second look at this sure to be scary sequel. 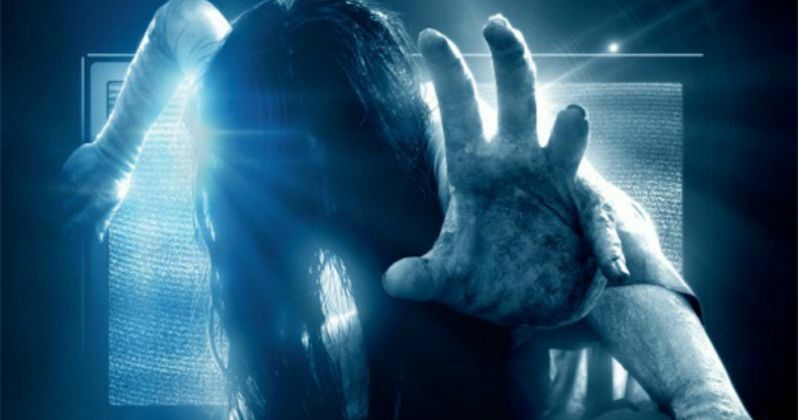 While this Paramount project was originally believed to be a reboot or a remake, that notion was quickly dispelled, with Rings confirmed as a new chapter in the Ring horror franchise. Rings was originally slated to hit theaters on November 13, 2015, just months after principal photography began, but it was later pushed into the spring of 2016. Then last February, it was pushed to a Halloween 2016 release date, before being pushed into the February 3, 2017 date. It sounds like this latest release date is finally going to stick! The Ring sequel is slated to open against another Paramount movie, Same Kind of Different as Me, starring Renee Zellweger and Greg Kinnear. It's possible that movie's release date will be shifted, since it's extremely rare to find a studio opening two movies against each other. It will also go up against STX Entertainment's The Space Between Us and an untitled Blumhouse horror movie, but Rings will have an even tougher time at the box office in its second weekend. It will be going up against the highly-anticipated sequel Fifty Shades Darker, expected to be one 2017's biggest blockbuster hits, along with Keanu Reeves' sequel John Wick 2 and The Lego Batman Movie. Based on the original novel by Kôji Suzuki, the 2002 thriller The Ring, an English-language remake of the Japanese thriller Ringu, was a big hit at the box office, taking in $129.1 million domestically and $249.3 million worldwide from a $48 million budget. The 2005 sequel, The Ring Two, wasn't quite as successful, earning $76.2 million domestic and $161.4 million worldwide from an unspecified budget. But after more than a decade's wait for the sequel, fan anticipation is at an all time high. And the change to see Leonard Hofstadter gruesomely eviscerated on screen may make this an even bigger success than expected. Check out the new scary trailer, if you dare.